Where To Start With Your WW2 Jeep? At one time each of us was a WWII jeep beginner. Below is a list of items to help you become educated about your Willys MB or Ford GPW…or to help you figure out what one looks like while you search for one. This list is based on a posting by “Iowa” on the famous G503 website. 1. If you haven’t already done so, sign up on G503.com Forums for a free membership. Don’t be afraid to ask questions, no matter how dumb…we all did (do) at one time or another. What better way to learn? The best place on the “G” to start is the MB GPW Technical Knowledge Base 1941 – 1945 Forum where Willys MB and Ford GPW questions are asked and answered, discussions on some fine point in the hobby are held and everything regarding anything technical related to the WWII jeep. It’s really the best source of information and it’s free. 2. Sign up for surfacezero.com/g503 to post photos. Learn how to post pictures on the G503 here. Posting photographs is one of the best ways to answer many questions like: What sort of jeep do I have? The back of my jeep says Ford is that weird or correct? Has my jeep been “bubba’d” or is it supposed to have a heater under the dash? 4. Buy ‘The Military Jeep Complete’ technical manual it includes: TM 803, 1803A, 1803B. You might also consider the electronic version as well! It is so very important to own these manuals because they tell you the basics of what you need to know. What grade oil to use? How do you service the brakes? 5. Buy the parts book ‘Ordnance Catalog SNL – G503, 1944’. There are several other WW2 parts books available but that one is a good start. Why do you need this one? Well, it contains a lot of pictures of the parts so that you can see either what you need to fix. Sometimes it is helpful in figuring out how the pieces go back together! See here for more! 6. ‘All American Wonder” vol I & II and this will give you the tear down and build up sequences. These were the granddaddy books of the jeep restoration “movement”. Ray Cowdery did us all a huge service for putting this information together. When some of us started on are jeeps these were not available and when they become available it was like manna from heaven. 8. Draw diagrams of intricate details. Trusting your memory? Well, a picture or a drawing to refresh your memory is a good thing. Can’t draw? Neither can I…then you might take a look at JeepDraw as they have a number of drawings available at a nominal cost. While the web site owner may seem cantankerous, he is a pretty good guy and only wants to protect his work…so read the advisories. 9. Save and restore as many original parts as possible. NEVER, NEVER throw anything old or original away, no matter how worthless you think it may be. Only after you throw a “useless” part will it’s true use and value present itself! If you think it is worthless, post a picture of it and then you might be surprised at the number of other people suffering from Olive Drab Disease offering you money for that junk your spouse wants you to get rid of! 10. Organize and label your bolts and small parts in small containers. This is so important because rarely does a rebuild go according to plan. Often there are delays and then you have to rely on your memory (see 8.) Of course if your jeep has been bubba’d then some of the parts will be left over if if they are otherwise good. Do not assume that parts you remove from your jeep belong there–remember that you might owe the survival of your jeep to him but that does not mean it is as it was originally. 11. If you want to overhaul your own transmission, get a copy of ‘Trouble Shooting & Rebuilding of the T-84’ or use John Barton’s excellent post on the G503. 12. A good source for the transfer case is here. 13. The TM’s are very good for most everything else. Check out all the period documentation that were available during WW2. The search goes on for more of them! 14. Moses Ludel’s book ‘Jeep CJ rebuilder’s guide’is also very helpful. This goes back to you cannot have too many manuals! 15. Attend military events, meet members & vendors. How can you find these out? One way is to check the G503.com Events forum on this topic. 16. 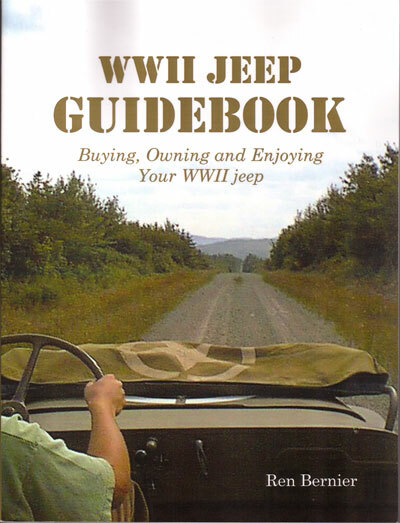 Subscribe to Military Vehicles (1-year) [Print + Kindle] which will connect you to most of the main jeep parts dealers. 17. Become a member of MVPA The organization has had some growing pains but it is worthwhile joining and getting involved. 18. Have fun bringing back to life a venerable piece of history!!! !